If you’re planning to carry out building works on your property, it’s worth considering our market-leading home renovation and extension insurance for the duration of your project. What is home renovation and extension insurance? 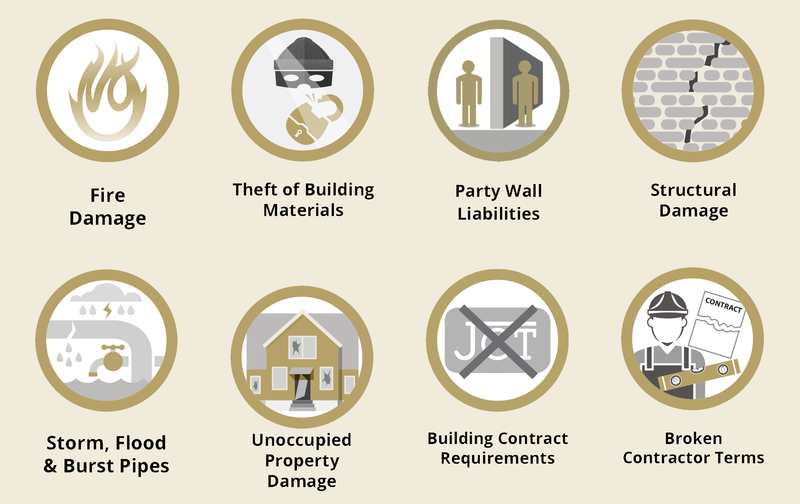 During a renovation, your property is exposed to increased risks – a serious fire, theft or major structural damage, could leave you exposed to considerable uninsured losses that you may not have accounted for. Renovation insurance ensures that should the unexpected happen during your home renovation, you have the peace of mind that your buildings, contents and the works themselves are fully covered. Our market-leading home renovation insurance policy offers you the most comprehensive level of cover available – for projects ranging between £50,000 and £50,000,000. Watch our short video explaining why appropriate renovation insurance is essential. Does my existing home insurance cover me during the works? During a renovation, most home insurance providers may reduce or even invalidate your cover, leaving your most valuable asset uninsured. Worryingly, an estimated 82% of homeowners are completely unaware their home insurance doesn’t cover them during renovation works. This means you are not covered, not only for risks associated with the works, but also standard risks normally covered by your home insurance whilst your home is undergoing a renovation. Why use Renovation Insurance Brokers? We only specialise in renovation insurance, therefore you can be rest assured that your project will be handled by an experienced and professional team. As an insurance broker, we negotiate exclusively with our carefully selected panel of AA rated insurers. This means we are able to offer you the widest cover available at the most competitive premiums. In the event of a claim, we act independently on your behalf – not the insurers. Renovation Insurance Brokers offers JCT compliant renovation insurance, providing you with one comprehensive insurance policy that remains separate from your standard home insurance, as well as your contractor’s insurance. This removes any uncertainty about what is and isn’t covered and puts you back in control. Watch our short video explaining the benefits of a JCT compliant contract. To discuss your renovation insurance requirements and receive a free indication of the cost to insure your project, contact our specialist team today on 08442 641 200.